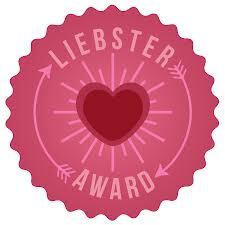 Today I have a new indie on the blog!!! 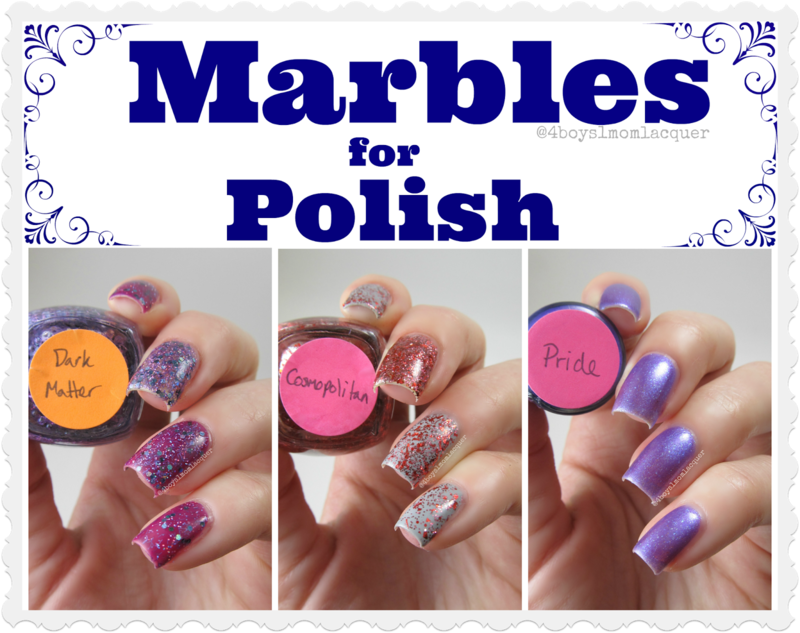 The company is called Marbles For Polish. The lacquers are all 5 Free which is amazing. 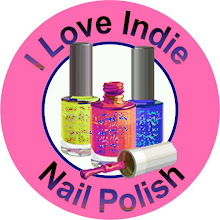 I know a lot of us look for polishes that have less chemicals. 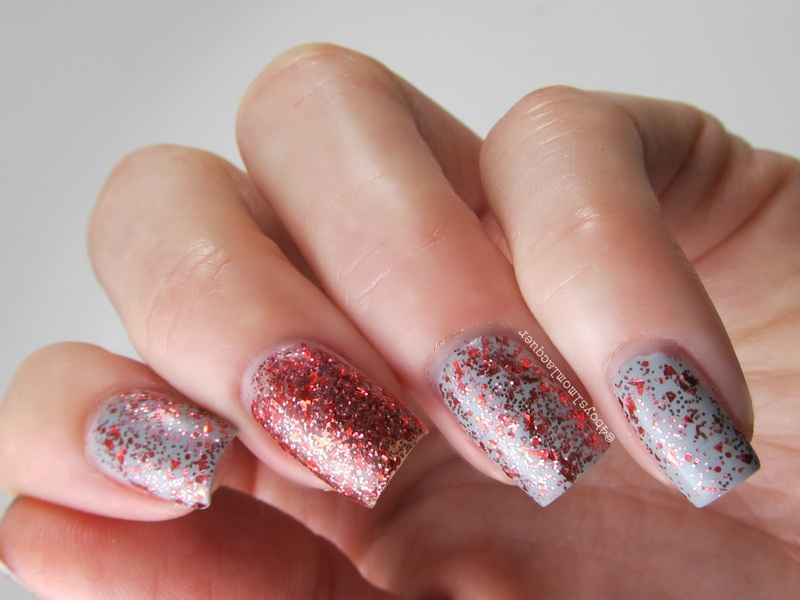 Shannon of Marbles For Polish sent me two glitter toppers and a lovely shimmer polish. Lets take a look at them below. 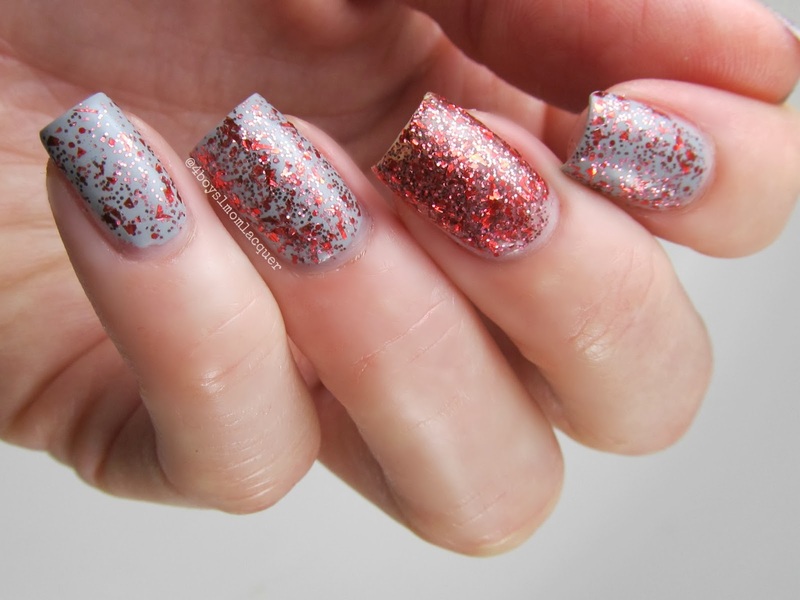 This is a clear base glitter topper with purple macro bar glitter,charcoal holo hexes and purple holo glitters. This color is a part of the Drunk Love Collection and was inspired by drinks. I applied 1 coat of Dark Matter over 2 coats of SinfulColors/Go Glossy and added a top coat. 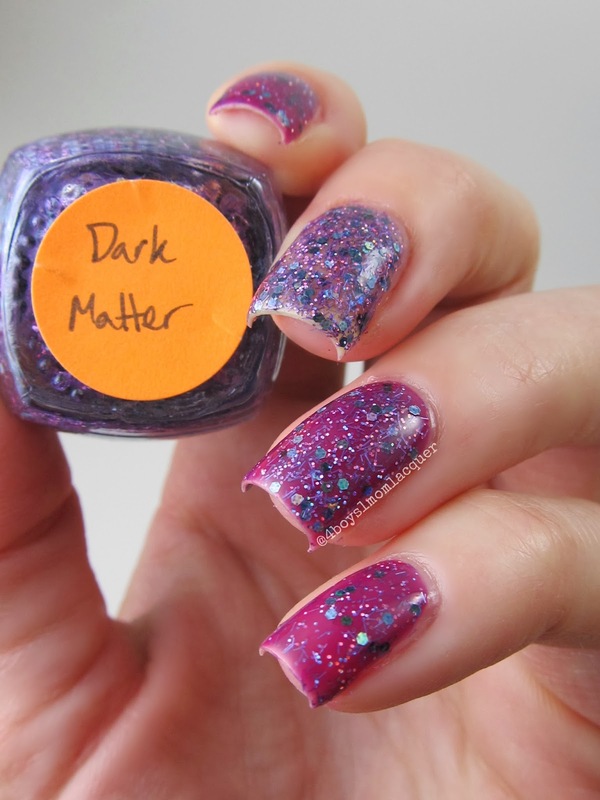 I thought you might want to know what Dark Matter looks like solo so I applied 2 coats with no undies on my middle finger. I had no issues with the formula or dry time.This is now available for purchase. 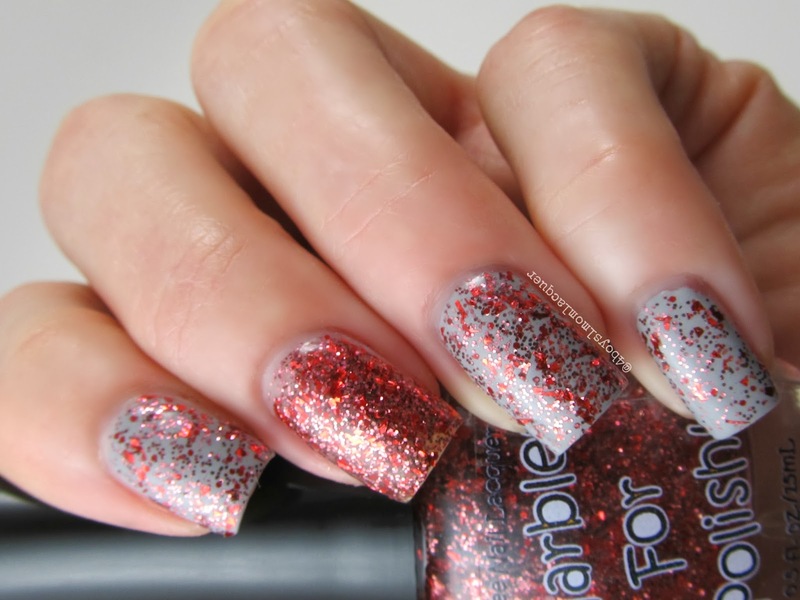 This is a clear base glitter topper with red shreds and red and pink hexes in various sizes. 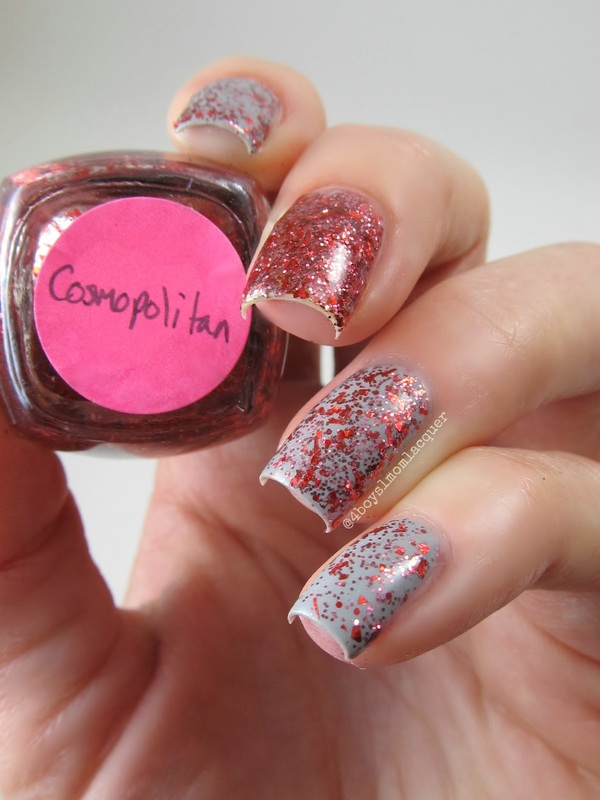 This polish is a part of the Drunk Love Collection. I applied 1 coat of Cosmopolitan over 2 coats of SinfulColors/Cool Grey with top coat. I also applied 2 coats of "Cosmopolitan" on its own on my middle finger. These glitter toppers can be used as a topper or on their own.This is now available for purchase. This is a purple shimmer polish with purple iridescent flakies. 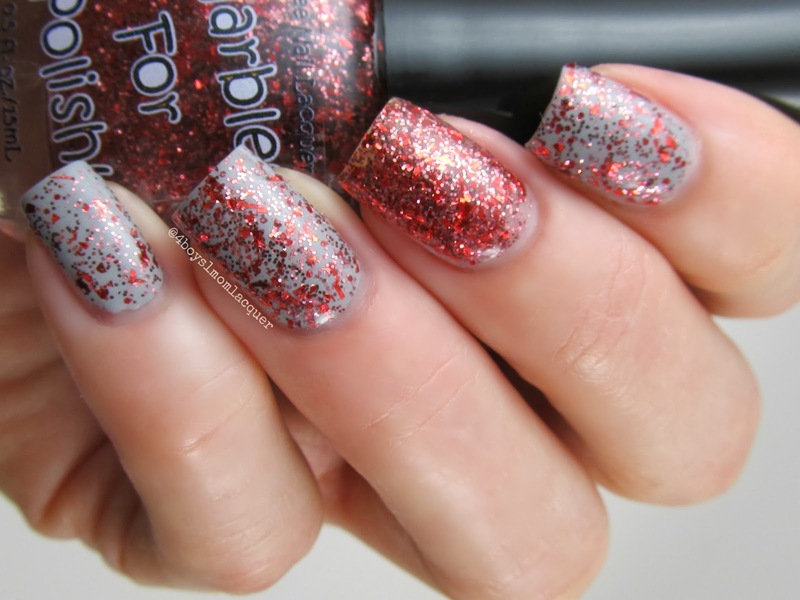 This polish is a part of the upcoming collection called 7 Deadly Sins and is not yet released. I applied three light coats. This polish is sheer but applied very nicely. I really think that Shannon did a great job creating these beauties. She is new to the indie making world but the way she makes her creations you would never know. Check out her shop and other social media for updates and new releases. Nice swatches, Pride looks beautiful!